The 7th annual Jerry Tarkanian Classic is being held December 18-22, 2018 @ Bishop Gorman High School (Las Vegas NV), Orleans Arena and surrounding area gyms. 94 high school boys squads (spread over 7 divisions) and 23 prep programs (National Division) are participating this year. Most of Wednesday’s Platinum Division action shifted to the Orleans Arena. National/regional media and scouts appearing on the event’s second day included Frank Burlison (BurlisonOnBasketball.com/McDonald’s All-American Game voter), Van Coleman (The Basketball Channel/McDonald’s All-American Game voter), Ronnie Flores (BallisLife.com & GrassrootsHoops.net), Evan Daniels, Josh Gershon & Travis Branham (Scouthoops.com), Eric Bossi (RivalsHoops.com), Jonathan Givoney & Mike Schmitz (ESPN/Draft Express), Sam Vecenie (The Athletic), Dinos Trigonis (Fullcourt Press & Nothing But Net), Christian Popoola and Jerina Madayag (PremierBall.com), Vincent Baldwin (VB Scouting), Samson Kayode and Mark Fox (USA Basketball), Etop Udo-Ema (Fullcourt Press & Dunk News), Cherokee Parks (NBA), Alex Carmon (BeachCityHoops.com), Arthur Puu (Overtime), Johnny Hines (Courtside Films), Marcel Chappell (BallerVisions) and Nick Koza (SportsAmp). Colleges that passed through on Day Two included Kansas, USC, Oregon, Gonzaga, Georgetown, Illinois, Utah, Colorado, Arizona State, West Virginia, Maryland, Oregon State, Ole Miss, TCU, UNLV, Xavier, Minnesota, San Diego State, Rutgers, Utah State, BYU, Hawaii, Cal State Fullerton, Tulane, Furman, Portland, Pacific, San Diego, UC-Davis, Southern Utah, Sacramento State, Idaho, Winthrop, UNC Charlotte, Missouri State, Weber State & UT-Arlington. 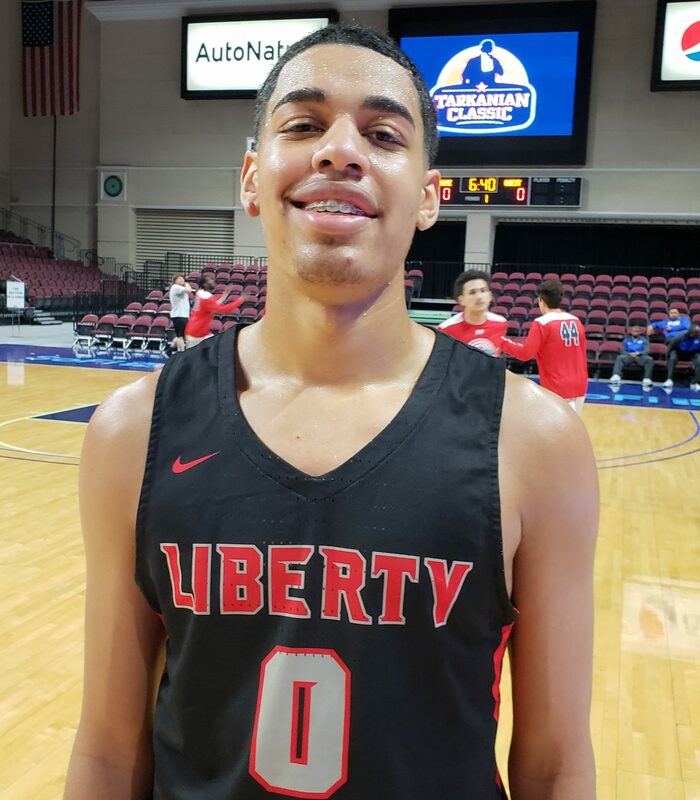 Julian Strawther, 6’7” 2020 Liberty (Las Vegas NV): It seems that Strawther loves playing on center stage at the Tarkanian Classic. 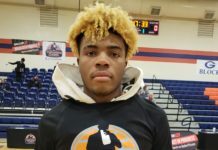 Last year he scored 37 points in a hyped high-major match-up vs. elite 2020 Jalen Green and San Joaquin Memorial (Fresno CA) and this year he even took it up a notch, erupting for 48 points (30 points in 1st half) in a narrow 71-68 loss to Mayfair. High-scoring WF has the scoring skills and length to be a major factor at the next level. Josh Christopher, 6’4” 2020 Mayfair (Lakewood CA): Strawther wasn’t the only player tingling the nets in the Liberty/Mayfair contest. 5-star Josh Christopher had plenty of scoring moments of his own (had a team-high 34 points) and it was his timely scoring down the stretch that helped push Mayfair past Liberty 71-68. 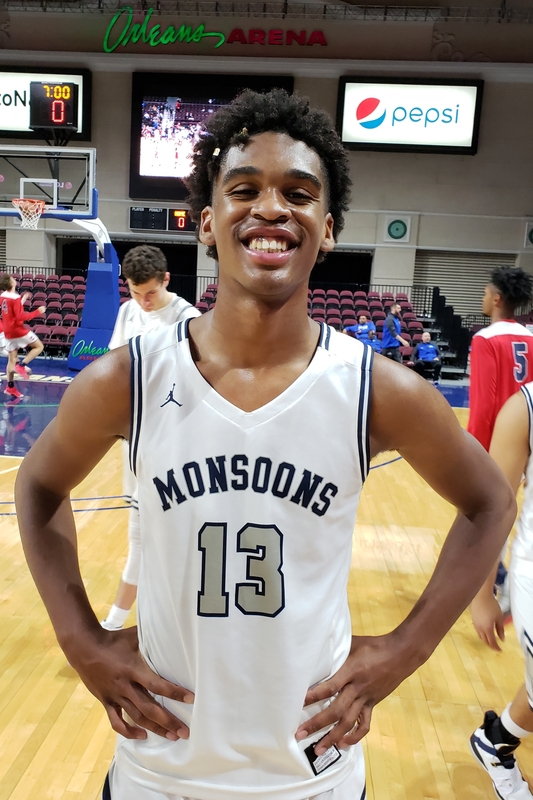 Christopher has many high-major suitors at the moment and sports offers from the likes of Kansas, Arizona, UCLA, USC, Oregon, Cal, Georgetown, Florida, Nevada, Missouri, Florida State and UNLV. Evan Mobley, 6’11” 2020 Rancho Christian (Temecula CA): Evan has emerged over the past year as the growing consensus national #1 player in 2020. Mobley showed his complete skill set in Rancho Christian’s 73-54 win over Constitution (Philadelphia PA) today: 22 points/17 rebounds/5 blocks. Long, athletic and skilled, Evan finishes everything around the rim and is a formidable rim-protector. Isaiah Mobley, 6’9” 2019 Rancho Christian (Temecula CA): USC-bound skilled forward can play both inside and out on the perimeter. 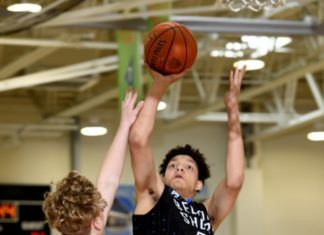 2019 McDonald’s All-American candidate had a double-double (13 points/13 rebounds) in a Platinum Division 1st Round 73-54 win over Constitution (Philadelphia PA). Isaiah has signed with USC (where his father Eric is an assistant coach). Oneyka Okongwu, 6’9” 2019 Chino Hills (Chino Hills CA): “Big O” is a beast on both ends of the floor! Strong and bouncy finisher with authority and terrific rebounder and shot-blocker. USC signee. Jaden McDaniels, 6’10” 2019 Federal Way (Federal Way WA): Fast-blooming player has experienced a meteoric rise as a HS prospect and now has cracked most national scouts’ Top 5 in 2019. 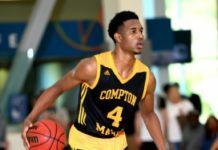 McDaniels’ final 5 schools include Kentucky, Texas, UCLA, San Diego State (brother Jalen plays for the Aztecs) and Washington. Noah Taitz, 6’4” 2020 Bishop Gorman (Las Vegas NV): Flame-throwing junior guard had a game-high 23 points (5/8 3FG) in Gorman’s 62-38 win over Lone Peak (UT). Excellent student is a very underrated athlete that has offers from USC, Stanford, Vanderbilt, Oklahoma, UNLV, Washington, Nevada, Minnesota and San Diego State. Makur Maker, 6’11’ 2020 Orange Lutheran (Orange CA): Very long big man is an intriguing prospect with impressive overall skills for a guy his size. Makur had 16 points and 8 rebounds in Orange Lutheran’s 59-60 win over Hall (Little Rock AR). Will be out of CIF eligibility after this season but is expected to go to prep school next Fall and be a member of 2020 recruiting class. Tari Eason, 6’8” 2020 Federal Way (Federal Way WA): Athletic West Coast 2020 sleeper has nice upside. Isaiah Pope, 6’4” 2019 Orange Lutheran (Orange CA): Underrated unsigned senior wing guard had a game-high 22 points in Olu’s 59-50 win over Hall (Little Rock AR). Father Tony Pope played at Long Beach State in the late 80’s. Jishai Miller, 6’4” 2019 Federal Way (Federal Way WA): Strong and muscular wing with nice perimeter stroke. 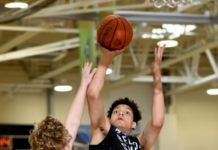 Miller had a team-high 18 points in Federal Way’s 54-45 win over Bishop O’Dowd (Oakland CA). Michael Ofoegbu, 6’7” 2020 Mayfair (Lakewood CA): Rangy forward with an athletic burst around the rim. Like Maker, will be out of CIF eligibility after this season but is expected to go to prep school next Fall and be a member of 2020 recruiting class. Dayne Prim, 6’5” 2019 Grandview (Aurora CO): Solid wing forward has a soft touch around the cup and nice agility baseline to baseline. Jordan Montgomery, 6’0” 2020 Rancho Christian (Temecula CA): Heady floor-leader has the requisite basketball IQ and all the other intangibles to run a team. 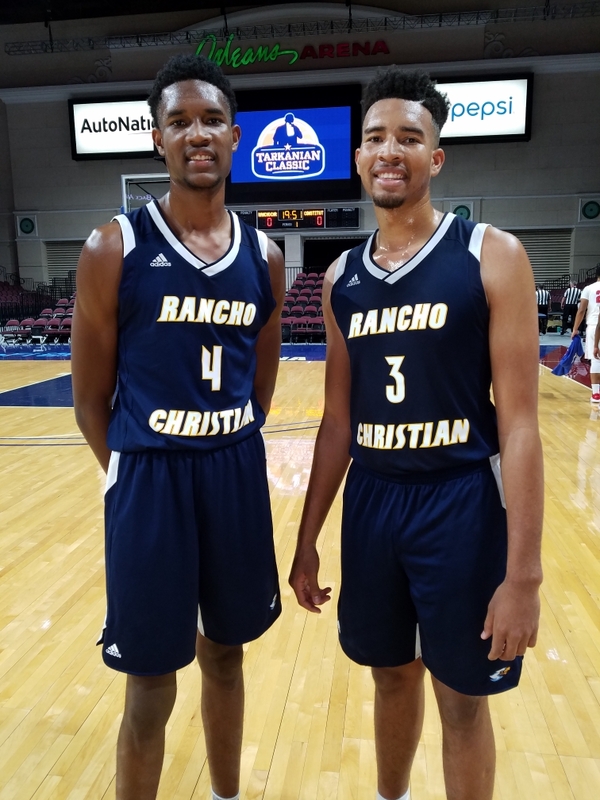 Love how he is very vocal with teammates on both sides of the floor and that he embraces the role of lead guard on his nationally ranked Rancho Christian squad. The Eagles currently check in at #17 in Ronnie Flores’ latest Fab 50 HS National Team Rankings. Lian Ramiro, 5’11” 2020 Grandview (Aurora CO): Quick point guard with good ball-skills is an excellent pull-up jump shooter.